The moment that I first saw pictures of Pena Palace in Sintra, Portugal sky rocketed to the top of my travel bucket list. A few months later, a was buying flights to Lisbon, and booking Airbnb's. Now I can happily say that Sintra did not disappoint, and I'd say that a day trip to Sintra is a must for every Portugal itinerary. Sintra is about an hour from Lisbon, and easily connected via train. We boarded a train from Rossio Station in Lisbon, which takes you directly to Sintra. A return ticket from Lisbon to Sintra costs €4.30, which I thought was extremely affordable. You will need to load this trip onto a Viva Viagem card, which is the same re-loadable card that you use on other public transit options in Lisbon. The train was comfy, and does not have assigned seats. We actually ended up sitting beside another young couple from Ottawa - what a small world! While we were busy making new friends, the train journey zipped by, and before we knew it we had arrived in Sintra. I would highly recommend getting an early start to your day, so you can beat as much of the crowds as possible. Most of the main attractions in Sintra open at 9:30, and we arrived around 9:00. This gave us enough time to take a bus up the winding hills. Bus 434 is the tourist bus, and a single loop ticket costs €5.00. You can also walk up the hills, but I wouldn't recommend this as you'll already be doing a ton of walking in Sintra, and there are no sidewalks along the winding (& steep!) hills. Another option would be to take a tuk tuk up to the top, which I've heard is the best option if you arrive a later in the morning and the lines for buses are getting a bit long & crazy. We started our day at the Castle of the Moors, which worked out really well. I think most people started off at Pena Palace, because it felt like we had the castle all to ourselves. However, by the time we were leaving 2 hours later, it was starting to get really busy. We visited on a very foggy day, which just added to the castle vibes. The Castle of the Moors (or Castelo dos Mouros), was built during the 9th century by the North African Moors, and it's still in surprisingly good shape. The grounds are quite large, with lots of greenery and flowers. We took our time walking through the entire grounds, and it was really nice to not feel rushed as we had arrived right at opening. Dylan absolutely loved the Castle of the Moors, it was so cute how excited he got! Our next stop was Pena Palace, a super bright & colourful palace that will make anyone feel like royalty for the day. While the fog added to the atmosphere of the castle, it didn't do Pena Palace any favours. If possible, try to visit the palace on a bright & sunny day, as that would really make the palace colours pop. Pena Palace is what Instagram dreams are made of. And trust me, everywhere you look, photoshoots are happening. 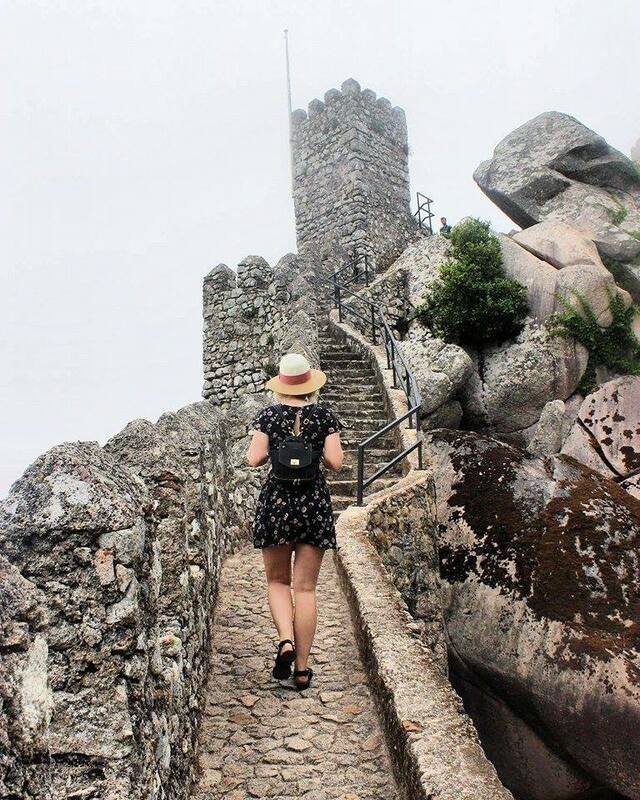 So, wear your best OOTD, but try to wear comfortable shoes because you will be getting your steps in during a visit to Sintra. After taking countless photos outside, and wandering around the palace grounds, we entered the palace. The interior of the palace is quite over the top, and definitely fit for European royalty. By this point, we were pretty hungry, and after doing a quick search on Happy Cow I found a restaurant with vegan options. Saudade is a cafe that is a 2 minute walk from the train station in Sintra. The staff were super friendly, and all knew what vegan meant. I ordered a veggie panini, which really hit the spot after all of that exploring! After re-fueling, we spent a few hours exploring Sintra. This is such a cute town, I'd definitely recommend spending as much time as possible just wandering around. We stopped into a few stores and browsed around, walked the cobblestone streets, and just enjoyed being on vacation. I hope I've inspired you to add a day in Sintra to your Portuguese itinerary! There's something for everyone in Sintra - adventure, nature, food, history, and a feeling of magic in the air. After spending a few days in busy Lisbon, it was nice to return to a more relaxed pace. Have you been to Sintra? What are your favourite European cities?